The Round Six Experience at the 70th Grand National Roadster Show was a hotbed of activity, and played host to a number of great guests! Here on Episode forty-five, we're joined by pat guests ("repeat offenders") Chip Foose and Carson Lev. It's a two-fer of the highest order, and these guys were a blast. Chip was being honored as "Builder of the Decade," and had an impressive display of a dozen cars, right across the aisle from the Gearheads, and talk turned quickly to judging and building cars to compete for the title of America's Most Beautiful Roadster... As well as macrame, bad puns and poop jokes, naturally. 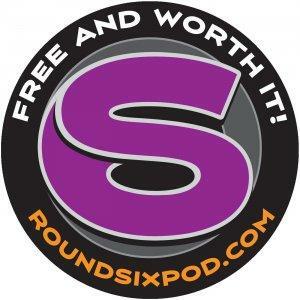 Better than just a social visit, this one goes deep into lessons on licensing, indemnity and marketing, not to mention some great connections with Disney, CarsLand and Round Six. Heck, we'll even throw in some behind-the-scenes history on a few iconic builds. All of that and some Hot Rod Elvis approval on marketing gone weird with our stickers. Enjoy. - "We don't have to be right; we just have to crush you"
– "Always a Happy Ending"